Vishal Sikka was a member of the Executive Board of SAP AG and the Global Managing Board, heading all SAP products and innovation. Sikka had global responsibility for development and delivery of all products across SAP’s product portfolio including Applications, Analytics, Cloud, Database & Technology and Mobile. Sikka left the SAP board in May 2014 for “personal reasons”. Sikka grew up in Vadodara (formerly Baroda), India, the son of an officer in the Indian Railways. He graduated from Rosary High School. Vishal Sikka studied computer engineering at M S University, Baroda. After completing his B.S. in Computer Science at Syracuse University, Sikka was accepted for the doctoral program at Stanford University. His dissertation was titled Integrating Specialized Procedures into Proof Systems and his thesis advisor was Michael Genesereth. He graduated with his Ph.D. in 1996. After a brief stint at Xerox’s research labs, Sikka founded iBrain which competed at the time with Business Objects. iBrain was acquired by PatternRX, Inc. His second startup, Bodha.com, focused on developing technology for non-invasive, service-based integration of enterprise applications and information. 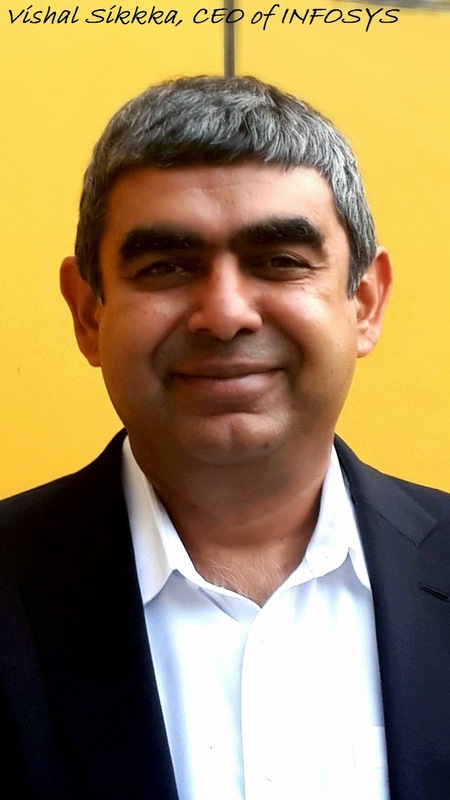 Sikka joined Peregrine Systems as their area Vice-President for Platform Technologies, responsible for application development and integration technologies and architecture, following their acquisition of Bodha.com. Sikka joined SAP in 2002 to head up the advanced technology group responsible for strategic innovative projects. Later he was promoted to Senior Vice President of Architecture and Chief Software Architect, responsible for the road map and the direction for the architecture of SAP’s products and infrastructure. In April 2007, Sikka was named SAP’s first-ever CTO reporting to then CEO Henning Kagermann. At the time, SAP spokesman Frank Hartmann stated that SAP felt it needed a CTO to oversee some broad changes that were under way at the company, including its renewed focus on the mid-market, the introduction of new on-demand products, and the continued rollout of NetWeaver and its SOA strategy. In the wake of Léo Apotheker’s resignation from the executive board in 2010, Sikka was named to a newly reconstituted board, along with new co-CEOs Bill McDermott and Jim Hagemann Snabe. His current contract expires in 2017. In 2008, Sikka joined the executive board of the CTO Forum, an influential industry non-profit community. The same year, he articulated his vision of ‘Timeless Software’ – software that does not cause disruption to the user as technology landscapes evolve – and proposed that this be a key pillar of SAP’s future development efforts. He has expressed his admiration for industry visionary Alan Kay and contributed a chapter to Points of View, a tribute on Kay’s 70th birthday. Sikka served as a member of the advisory board for Coghead from 2006 to 2009 along with industry influencers Steve Bourne, Guy Kawasaki and John Seely Brown. Coghead was acquired by SAP in 2009. Sikka has been an influential advocate for HANA, SAP’s new In-memory database technology. He spearheaded the development of HANA since his appointment as CTO with support from Hasso Plattner. Since assuming his seat on the executive board, he has spoken on multiple occasions about the potential of HANA as a breakthrough in the enterprise software space. Previous story China’s campaign to bulldoze mountains to build cities needs expertise to avert geoengineering problems.